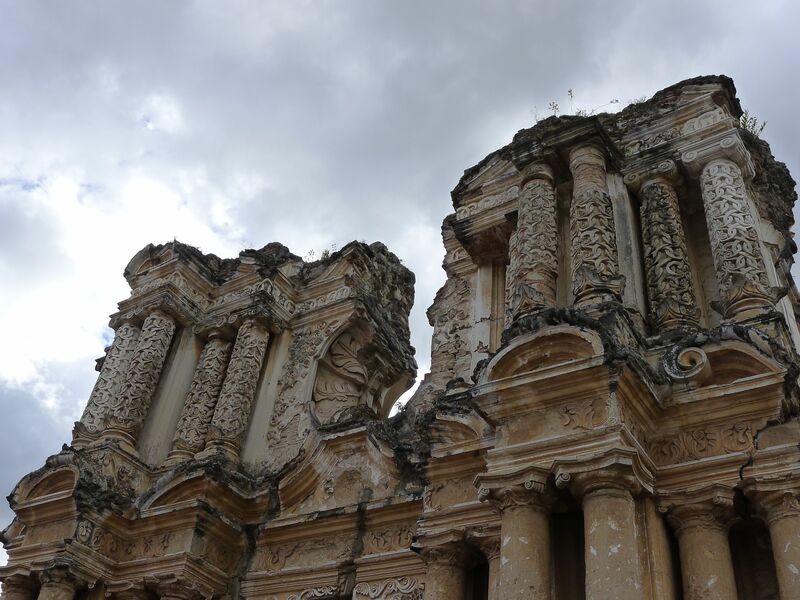 The ruins of El Carmen are yet another set of impressive, post earthquake ruins that raise up to the Antiguan sky. 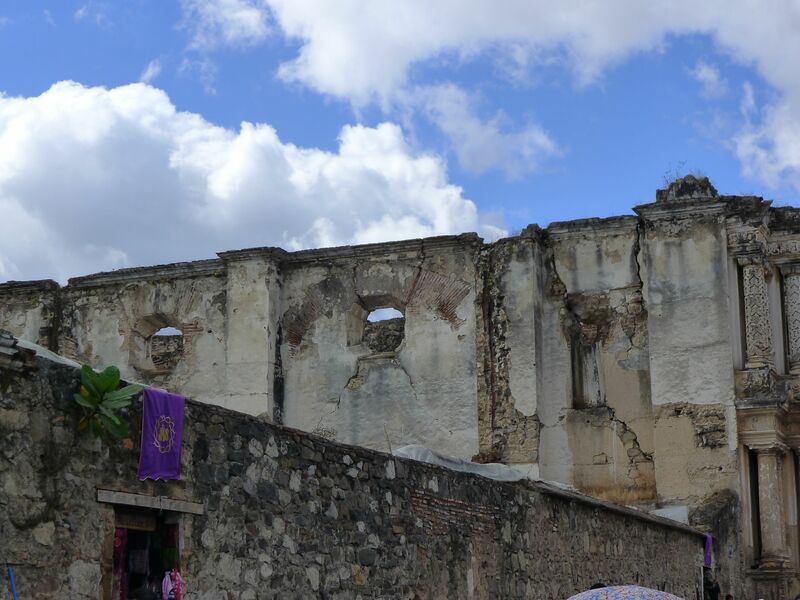 Unfortunately these ruins are not open to the public, however, the colorful Mercado del Carmen, a Mayan textile market, is open and ready for business. 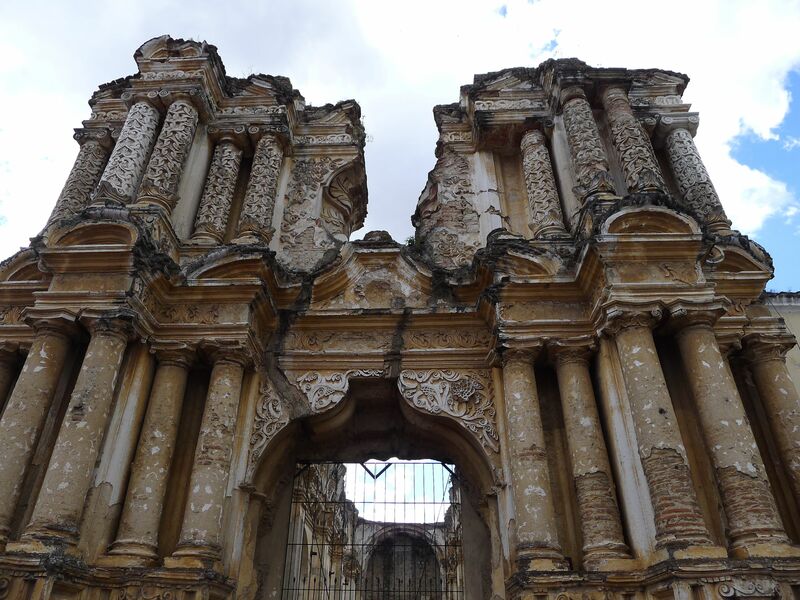 I found this series of photos around the ruins of El Carmen to be some of my most favorite from the trip. 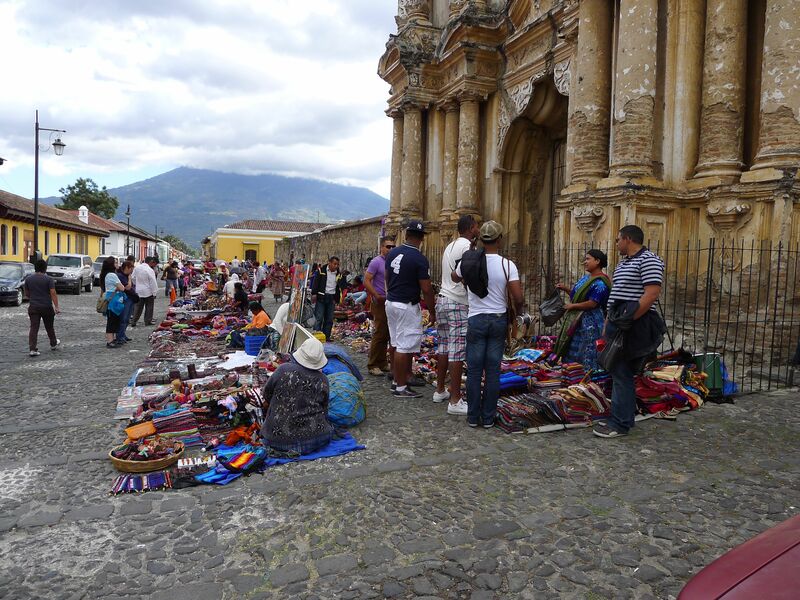 The array of colors, culture and architecture capture the heart and soul of Antigua and her mystical charm. 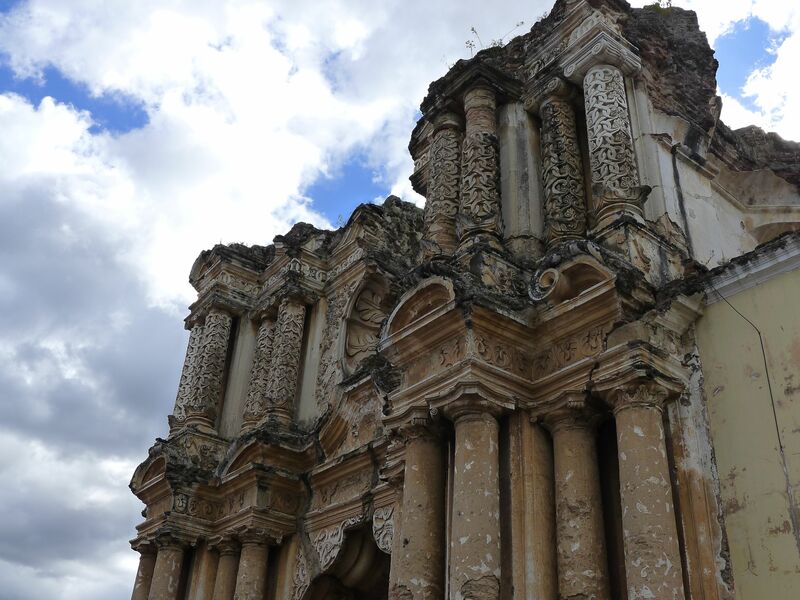 Unfortunately there is not much information on El Carmen however the pictures themselves perhaps tell a story of what this lovely church must have been like before it became destroyed over years of earthquakes. 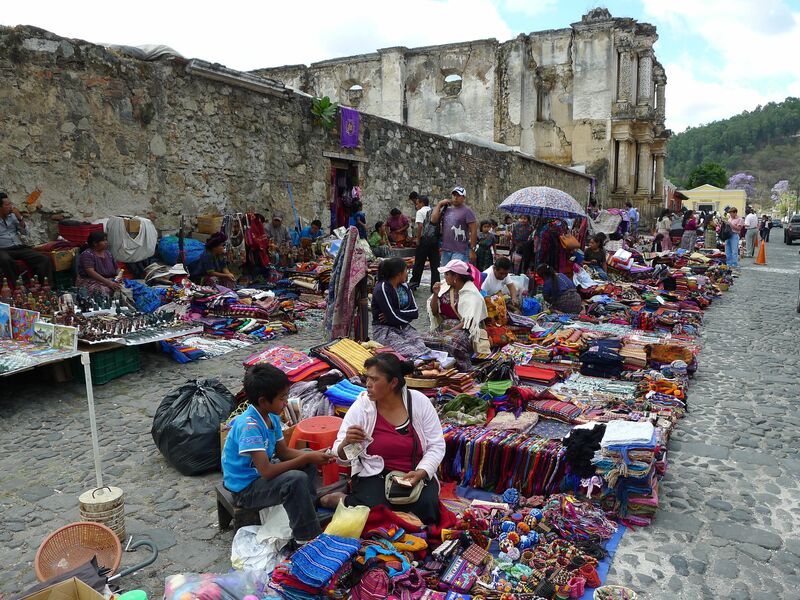 And the lovely colorful market which surrounds the ruins provide one more example of the majestic Mayan culture in all its splendor. 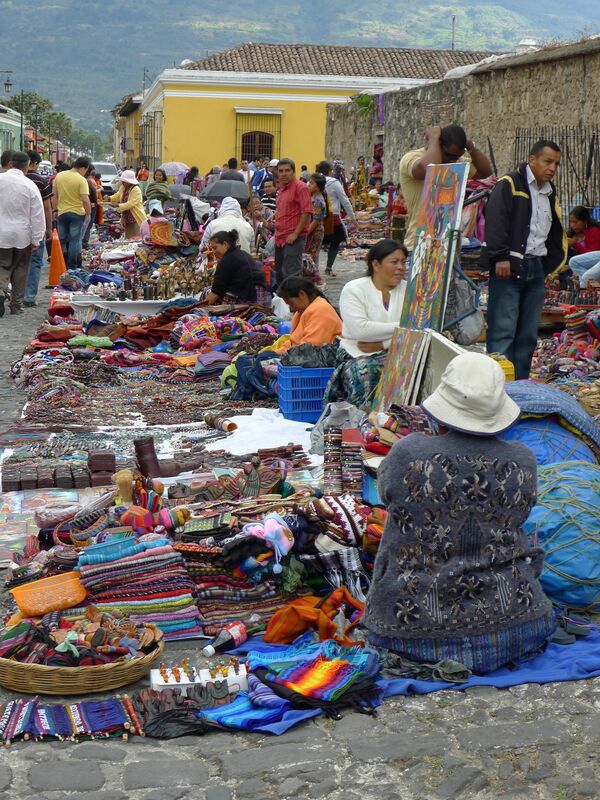 If I hadn’t already had a rather large supply of scarves, table runners and other textiles from India, Nepal, Costa Rica, Morocco and Argentina, I am sure I would have gone a little crazy here at the mercado. I love handicrafts! Yet I couldn’t possibly buy anymore. My husband would have shook his head at me and told me to put it in the basement (our running joke for stuff I buy from my travels that has no where to really go in the house). 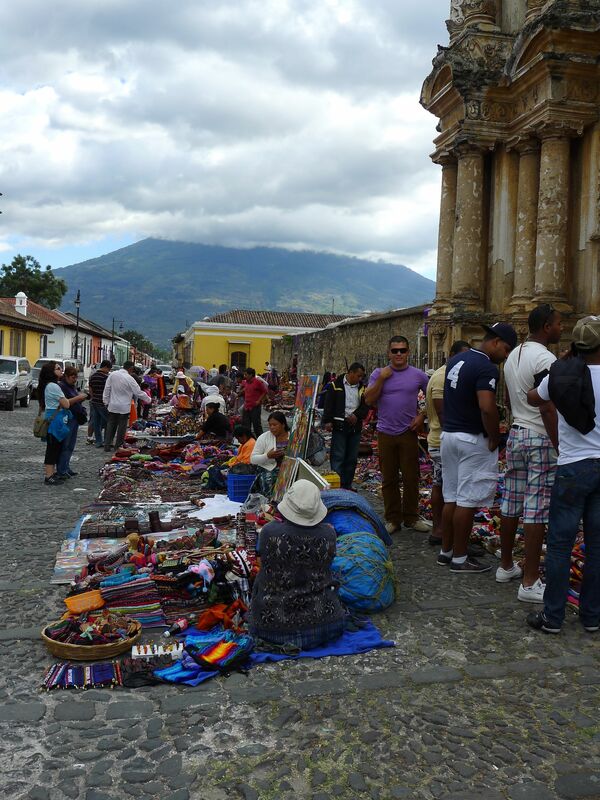 Looking back, I wish I would have bought something here but I did already buy some Mayan textiles from lovely Maria back in Xela, the woman who wove her art right outside the Casa Xelaju where I studied Spanish. These kinds of purchases are often much more meaningful to me as they instantly remind me of where I bought it, why and from who. There can’t be a gift much better than that. Another great series of photos, Nicole! That day is fresh in my memory again!!! God, I would have loved to shop there! 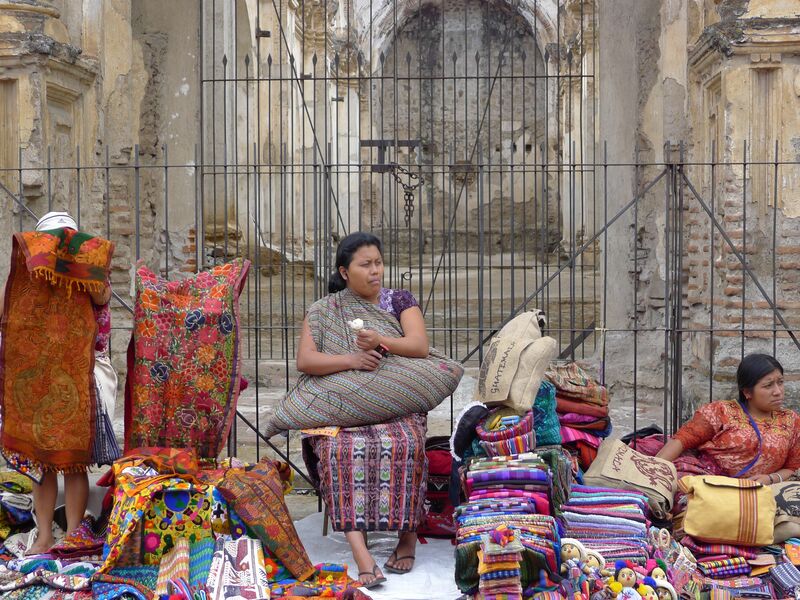 The colors of the textiles are amazing! Hope you are enjoying your Sunday, Nicole. What beautiful photos. I would go crazy buying things. Why thank you! 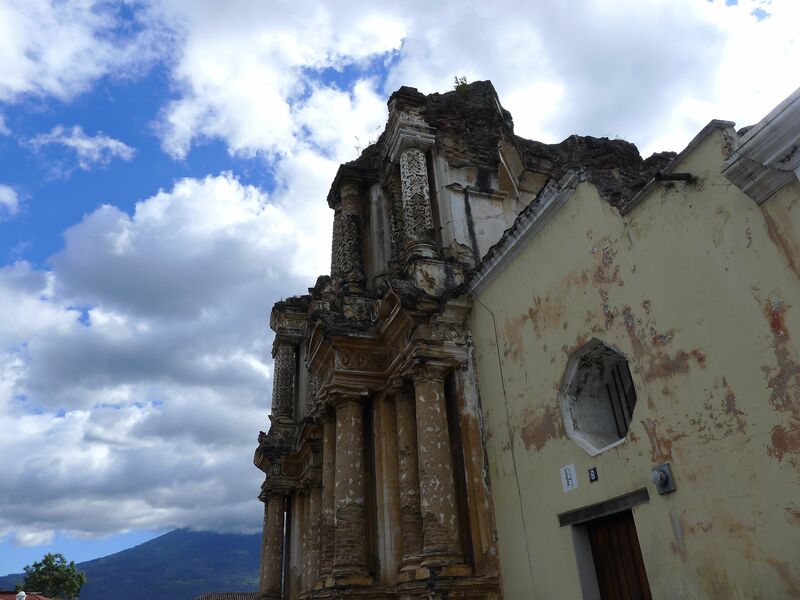 I sure loved Antigua and enjoyed it immensely! At the risk of sounding like a stuck record….awesome! Beautiful photos. 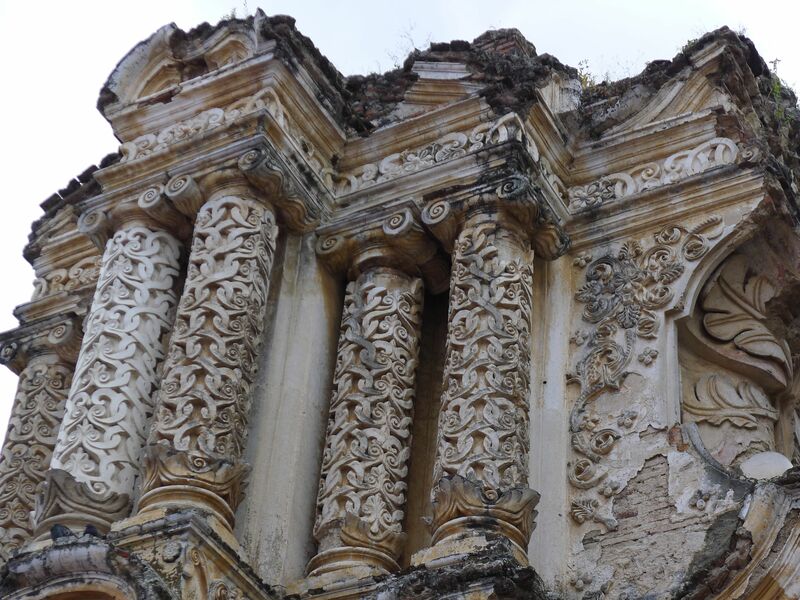 I especially love the detail on the columns. 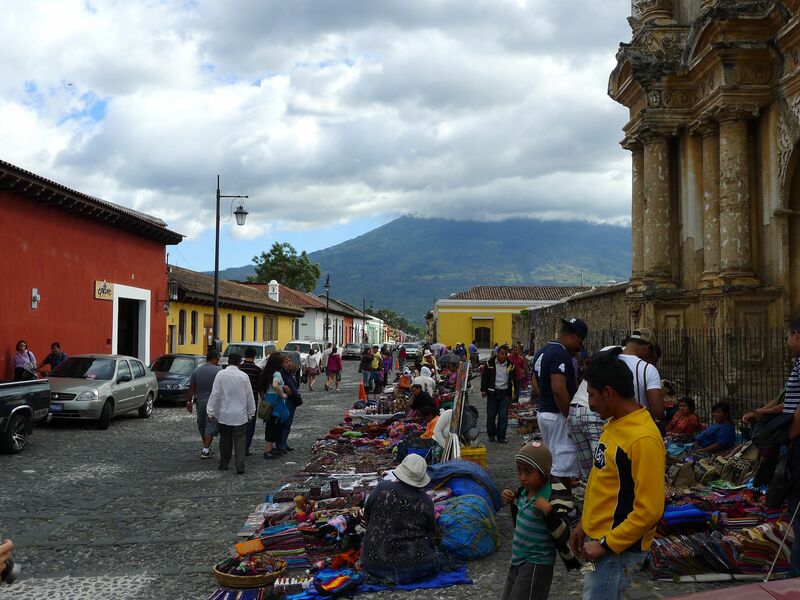 Such an incredible contrast against the colors of the market and the bright blue sky behind. Well done Nicole! Thanks Meghan! I still need to read your part 1 from the road trip. I read part 2 and am behind in all my posts! No worries Nicole! I imagine you’ve been busy lately, you’ve been writing up a storm! (which is great for me, because I love reading your posts). I know how you feel regarding purchasing stuff on travel. We don’t have anywhere to but the stuff anymore, but we love how it looks and end up getting some anyway. I understand now how art collectors can have thousands of items in their collections and are only showing a small fraction of it. I have told my wife that we will just have to go down into the “archive” and rotate items into the display. I don’t know if it will work but that thought and hope allows us to continue to get stuff with no place to put it! I love the photos in this post they are so fantastic! The textile prints and color in the scarves and fabrics are so inspiring! Yes, this place was absolutely gorgeous!!!! I love scarves myself so once I was at this market, it was hard not to go crazy!